Buy me no baubles and I’ll save you the trinkets. Here are the gifts we really need this holiday season. This gifts we give all year. This gifts for which we forget to send thank you notes. The gifts that shape the giver. My Christmas list for the world. The gift of listening. Even when your blood is running hot, and you don’t quite recognize the person across the table any more, when you are questioning how the two of you became friends/lovers/business partners/spouses, and all you can see are the horns pushing out of the other one’s head. There is the gift of taking a deep breath, sealing your mouth, and listening. Quiet is a gift. The gift of time. This is the gift of letting the dishes pile until they topple, your eyebrows grow bushy, your car losing oil, and your work piled on the desk, all because you gave your time elsewhere: to the care of a sick child, to the creation of a new piece of art, to the grieving friend, to walk the rambunctious and anxious dogs. The gift of your voice. 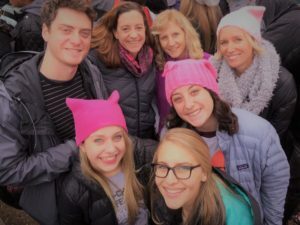 When you scrape up the money for a ticket to Washington DC, stitch your pink hat, walk through the cold and yell out in unison that Love will Trump hate. That is a gift. When you write another email to your congressman, and picture them reading it and having an ha moment, changing their otherwise hateful vote. When you blog about the inequities in Puerto Rico, or send a thank you note to the woman who outed her abusive (congressman) boss. When you simply stand up, in a crowd and say “Hey, I saw what you did.” When you refuse to be silent. The gift of your vision. There is a way out of our current madness, a way to save ourselves, our country and our planet, but not without the vision of thousand open minds. And your vision, though it may seem foggy, obscure and even irrational to you, might be the one that changes the tide. We cannot know if it is never shared. The gift of your story. The way your grandmother pinched your arm if you told her not to blow smoke on you, the night your house burned down but your dog found her way, the day you identified your attacker in court, the seashell you found with your dead friend that still hangs quietly by your mirror. Every story awakens some part of us, draws an invisible connection from one to another. In the points of intersection, the reader and writer can no longer be strangers. Together, sharing, reading and writing, we create a web. But we cannot find one another in the dark, if our stories are never told. The gift of kindness. Kindness is rooted in authenticity. It takes thoughtfulness and intention. It is saying “come in,” to a neighbor who looks down, when you were ready for bed. It’s turning the car around to check on the person on the side of the road,. It’s my son’s high school teacher baking cookies on his 17th birthday. It’s reading the work of a young writer, gently. It’s walking the lost child home. The gift of love. This is, after all, the gift that trumps all gifts. To open your sore and tired heart to another soul, to let them in, despite the very high odds that they will some-day disappoint you. To look them right in the eyes and say, in your words or in your gaze, I love you. This is the gift the world needs most.